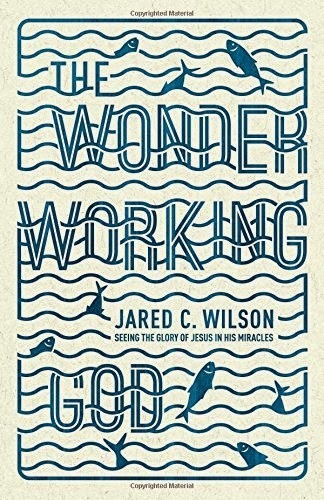 From the very beginning of Jared Wilson's The Wonder-Working God: Seeing The Glory of Jesus in His Miracles, I was enthralled. Wilson did such a great job of pointing the listeners (the copy I have is audio) to Jesus. He read the Biblical account of the miracle then offered a thorough explanation that revealed numerous truths about the character of Jesus. And to aid in our understanding, he also offered personal anecdotes throughout that I found helpful and interesting. I have been a Christian for many years and I have been in church my entire life, so I have heard many Sunday School lessons and sermons that reference any number of Jesus' miracles- feeding the five thousand, water to wine, raising the dead- I've even taught about them myself. But this book goes beyond just a basic understanding of what took place during each event and explores the very nature of Jesus as he is performing the miracles. These miracles that we have heard about for years and years lose the complacency with which we view them and instead they become amazing examples of an amazing God, so that our focus when reading about these miracles becomes about the miracle worker, and not just about the miracle. The book is read by the author, Jared Wilson who has an engaging voice. And because Wilson narrates the book himself, you can hear the emotion in his voice through the reading of his personal stories as well as the love he has for Jesus Christ. This book is for everyone who wants to know more about The Wonder-Working God, non-believer, seasoned believer, or new believer. I highly recommend this book and the audio version of it to everyone. For many people, audio isn't your thing, and that's perfectly fine. I didn't think it would be for me either, but I love it. I listen to it on the way to and from work. Already, last week I shared something I learned from this book while leading the devotion at our church's Women on Missions meeting. And I've found myself referencing this or that in the book in conversations with my husband, who reminds me that he hasn't read it yet, to which I respond, "Well you really need to, because it is so good." And I say the same thing to y'all- you really need to read (or listen) to this book, because it is so good! I'd love to hear from you: If you have read the book, what did you think? Let me know in the comments below.